Heat your water to around 110 degrees. I use filtered water and put it in the microwave for about a minute. When you feel the water, it should be very warm, but not HOT. You want to wake the yeast up and activate it, but you don’t want to kill it. Once the water is at the correct temperature, put half of it in a small bowl, and mix in the honey. The add the yeast and let it proof while you are adding the other ingrediemts to the mixer. You will want to let this sit for about 10 minutes. This is going to depend on the type of grill you have. On a less expensive grill, the flame is too close to the crust and you will burn it if you cook directly on the grate. I have a Weber Genesis grill. With the model I have, the flame is far enough from the grate that it won’t burn your crust, so I cook directly on the grill grate. 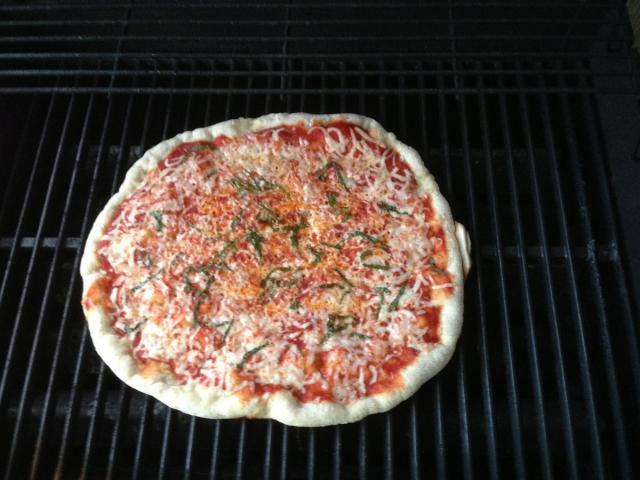 If you have a grill where the flame is closer, I’d recommend using a pizza stone on the grill. Let it get warmed up for at least 20 minutes. Put you grill up nice and high, keep the lid closed and heat the whole grill. 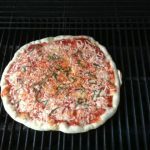 When you are ready to cook your pizza, open the grill, put he pizza in and close the grill as quickly as possible to keep the temperature high. You pizza will cook FAST, so check it after the first 3 minutes, and then every minute or so after. It will only take 4-6 minutes to cook. You will likely find that your grill has hot spots. If this is the case, your pizza will benefit from being spun 180 degrees half way through the cooking cycle. The process to cooking in the oven is very similar to the grill, but you don’t have to worry about burning the crust as much. You’re going to want to get your oven VERY hot – between 500 & 550 degrees. Heat the oven WITH A PIZZA STONE in it for a minimum of 30 minutes to be sure the pizza stone is hot. When your oven and stone are fully preheated, put your pizza on the stone and bake for 4-7 minutes, until your crust is golden and cheese is starting to brown. Depending on your oven, there may or may not be hot spots. If you see your pizza is not cooking evenly, spin it half way through.